Abstract: The i845 chipset is known to be one of the slowest P4 chipsets out there. The i845 chipset is known to be one of the slowest P4 chipsets out there because SDRAM is just not advanced enough to supply the Pentium 4 processor with the necessary amounts of bandwidth it craves. The only good side of combining a Pentium 4 (socket 423 no less) with SDRAM is on the sellers side, where costs are a lot lower than if DDR was used. Good for your grandmother maybe, but this is definitely not a performance motherboard. With a retail price of $140 CDN, the 845 Pro2 is probably one of the cheapest Pentium 4 motherboards around from a good name brand. 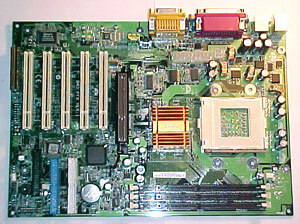 As the board uses still uses the older Socket 423 it is not exactly a shining example of upgradability. The 845Pro2 has three DIMM slots that can accommodate up to 3GB of PC100/PC133 SDRAM, a 4X AGP slot with 1.5V lock (meaning only videocards that are 1.5V compliant will work with the motherboard - this is a limitation of the chipset). Five PCI's allow for ample expansion expansion room in the "future" should you need to. MSI have also included onboard audio which is taken care of by VIA's AC'97 software codec. The general layout of the MSI 845Pro2 is acceptable and easy to work with once installed in a case. The usual stuff we don't much like are the placement of the ATX power connectors behind the parallel ports - this puts the power cables over the CPU fan which cad disrupts airflow. The placement of the IDE/floppy drive connectors which I would normally say are too low, are in a fine position as this board is not likely to ever see the inside of a large case. Three full length PCI cards can be used in the in the board without any IDE interference issues. Since the board only has five PCI slots, we were a bit surprised that we still needed to remove the videocard to install the memory. It was nice to see that MSI uses a rather large orange heatsink for the i845 northbridge even though it didn't get too hot during our testing. Heck, you can never have enough cooling right! The AGP slot has an AGP lock so the videocard will stay in place even during transportation (to a LAN party perhaps). The onboard audio isn't the best, however if you're on a very tight budget this board is going to give you what works. For those who are interested in overclocking this board was up to the task remarkably. The Award BIOS allows for the usual tweaks we'd expect from MSI, however our Pentium 4 1.7 GHz Socket 423 chip wasn't a very good overclocker. The highest we could push the chip and board was up to 111 MHz FSB. Not bad and we're pretty sure that it was the CPU holding us back. For some reason the 845Pro2 just wouldn't complete the Internet Content portion of SysMark2001. Every time it crashed at Photoshop. Very weird. Still as we can see, the board doesn't fair too well, those are some of the lowest numbers we've ever seen. Like SysMark2001, the 845Pro2 fails every time Business Winstone 2001 is used! We're not sure what's going on here either. In Content Creation 2001, the board doesn't do well even when overclocked.